Conferences and B2B networking events can be a great catalyst for growing your startup, but only if you’re prepared to “work the room” in the right way. For those of us who attend conferences, workshops and industry events regularly, it becomes easy to spot the different ‘networker’ profiles. There’s always the ‘straight out of college’ marketing intern who fires out business cards at light-speed and performs the same pitch to every person. The quiet developer who slinks in the background avoiding eye-contact. And the somewhat creepy terminator-esque sales whizz who scans the crowd for his next target, then pounces. Conferences and B2B networking events offer a great means of extending your network, meeting new clients, hires, partners or investors. But when dealing with experienced Business-to-Business networkers, you need to be prepared to work the room in the right way, and show the best version of yourself and your company. B2B networking requires a very different skill set that B2C. When dealing with large business contracts that could amount to six or seven figure payments, the aim for events should be to start the right conversations with the right people, not to try to close sales. Before heading to B2B events, it is important to make a ‘target list’ of companies that are attending and that could benefit from using your product. If the conference you are attending has an event app, it will make this much easier, but if not then you will need to get trawling LinkedIn, and social media to get some clues as to who will be there. Limit your list to 5-10 people for a 2 day event, as you want to have time to have meaningful conversation, and also leave time to catch up briefly with existing contacts. Considering your aim is to build relationships, it is always a good idea to introduce yourself and your product in a short message via LinkedIn, email or Twitter in the week before the event. This breaks the ice, and also offers you an ‘in’ to spark up a conversation during an event. It also makes you more familiar with the person’s photo, so you will be able to spot them in a busy room. At the event, try to approach people when they are not busy, and initiate friendly conversation in which you show them the value of your product for their particular company, without making it sound like a sales pitch. Try to keep conversations brief, but don’t make it seem like you are in rush. On the flip side, you don’t want to take up too much of someone’s time as they probably have lots of people to speak to. The benefit of making a ‘target list’, means that you can take the time to adequately prepare for each of your ‘meetings’. While you don’t want to turn the other person off by behaving like a second-hand car salesman and pitching straight off the bat, you should research each company, and be prepared to show them the different aspects of your service or product which would be most useful for their particular business model. While it will seem presumptuous to present them with a full business proposal at such an early stage in your relationship, it is always useful to have background information about the company, their clients, and their existing service providers, so that you can offer them examples and case uses which are relevant for them. Think about value you can offer, and also have some data points to hand, based on other happy clients you have which work in the same industry, or have similar business models. Using a ‘third party’ example which is backed up by figures, shows the other person the potential ROI they could gain from working with you, but doesn’t make it too obvious that you have been planning to pitch to them. First meetings with potential clients should be as much about receiving information, as giving it. One of the benefits of having researched a company before you meet with the representative, is that it allows you to ask the right questions, in order to get the right answers. This will allow you to better prepare for your next meeting, in a more formal, business setting. Your aim is to build relationships, so don’t just jump straight into business. Forbes contributor Elana Lyn Gross offers a range of questions which allow you to break the ice, and encourage the other person to open up a bit about themselves, and their companies, in a natural manner. Be conscious not to be too intrusive. While it is ok to ask if a company used a service, it is less appropriate to put them on the spot by asking which service provider they use, and how much they pay. Your intention should be to find ways in which you can offer value to the other person, whether it be with your product, a recommendation, a piece of advice, or another person who you could put them in contact with which could push their business forward. A great way to open the door to further conversations, is by doing something for the other person. It is important to give more than you take, before you jump in for a sale. In some way or another, there is always some way which you can help out a new contact. This could be a recommendation for something to do in the city where the event is being held, a recommendation for a good business text, article or resource, sending the link to a useful program or app, or putting them in contact with someone who could be helpful to them. Doing favors and making recommendations or introductions allows you to start off your relationship in a positive light, gives you a reason to follow up with the person, increases the chance of developing a real connection, and in turn will make the other person more open to giving you the time of day, when you make them a business proposal. While handing out cards remains a ritual in the business world, paper business cards days are numbered. They are collected in pockets, only to be dumped in a drawer, and never looked at again. While it is always useful to have cards available, it is better to try to connect in the moment, using the LinkedIn app, or a range of new digital business card apps. For the less tech savvy, I recently met a quirky founder who had a photo of his business card on the case of his phone, so people could just take a photo of it. However, always be sure to get the other person’s details, card, or connect with them in the moment, as if you only hand over your details, you put the ball in their court to get in touch. Then at the end of the event, you can look at your new contacts, and follow up with each of them with a personalized message. 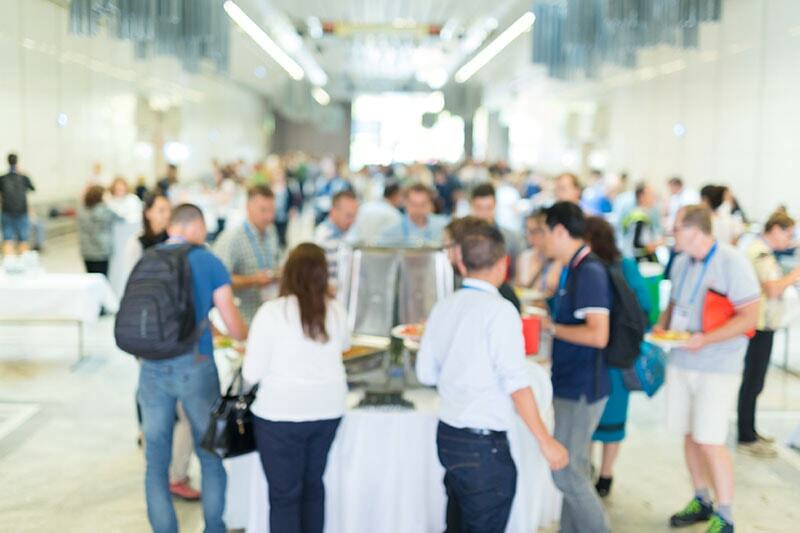 Nowadays, many B2B networking events are making it easier for attendees to connect in a more natural manner, by offering internal event apps, which allow users to browse other attendees, and make appointments and send message online. However, while these apps are extremely useful, you should always have an ‘old school’ backup plan. Preparing before B2B events, knowing who you want to speak to and when to approach them, and offering as much value as possible are the best ways to make real connection that can turn into real sales. Act like a human, and people will open up to you. Act like a sales robot, and people will give you a wide berth.